Finding a Barber is like hitting a home run to me. Finding a key date Barber dime is a grand slam! I was hunting a very old park last Saturday finding only modern coins and listening to a musical orchestra of trash (Etrac owners know what I mean) when I hit an interesting signal. 10-43, 11-44, 12*44 then some iron numbers included. The signal was 6-7″ and hard to stay on top of. Since all my earlier deep targets were really ugly numbers I went after it. I saw the silver rim and I thought Merc, but then I saw it was a decent shape Barber. I carefully picked away the dirt to see the date, 1895 O, SWEET! It wasn’t until I got home and looked it up and realized it was THE key date for Barbers dimes. I just found my second barber dime (1911D) the day before in an old yard. I was pumped about that. 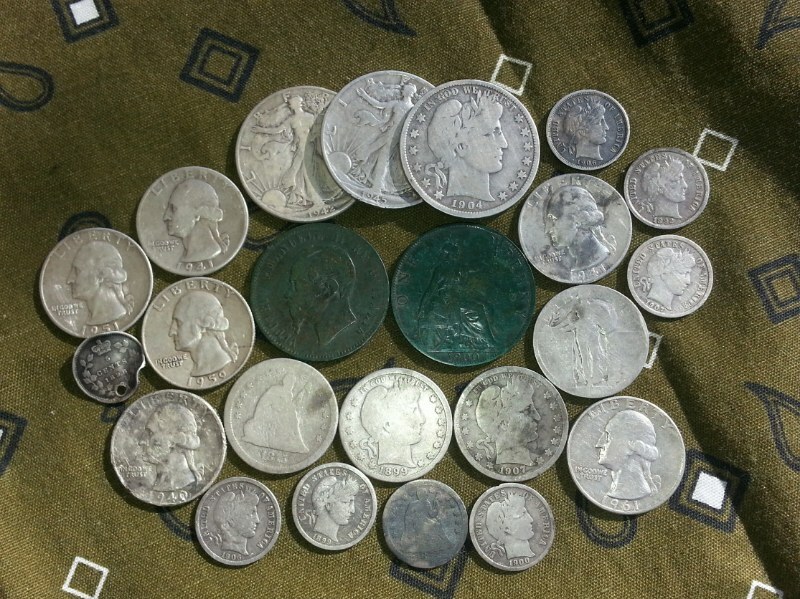 These finds makes my two silver rosie’s this week boring news. So I’m at 47 silvers for the year, wow, I’m still having a hard time believing it. Here’s what I’m learning, don’t discriminate too much, go slow regardless of the amount of trash your hearing or the constant hum of thresh hold, watch your depth meter and when you start hitting a lot of deeper targets, investigate each target. I know it seems like a hassle, but the Etrac isn’t perfect and may need a little more time to make a better ID. Best of luck to you! I’ve still been hard at this last week. The weather has been super dry and I’ve found it helping me find really deep coins in loose black soil. I’ve always thought it would be the opposite. Then we received 3+ inches of rain in the last few days and now I cannot identify the DEEP coins. The really dry soil reduces the falsing of iron allowing me identify coins nearby. So I’ve developed another strategy for hunting different sites now. I love that feeling of pulling a deep silver quarter and dime out of a hunted out park. I would really like to know the feeling of hunting a virgin park! My coin count is really taking off so I must be doing it right.